We have redefined the principle of the lever: small lever, big effect. A small lever on the underside of its top allows our lift coffee table to grow in height - smoothly, though not infinitely. This way, you can adjust its height comfortably to your needs - up to the height of a dining table. lift can therefore be placed next to a dining table, if required. A perfect match: The right-angled shapes match the widths of our tables. A soft-touch closing mechanism easily opens the practical and handle-free drawer, which includes internal partitioning, creating a useful storage space. Your favourite magazines are always within reach in the generous storage compartment opposite, which is also a key design element of our lift coffee table. 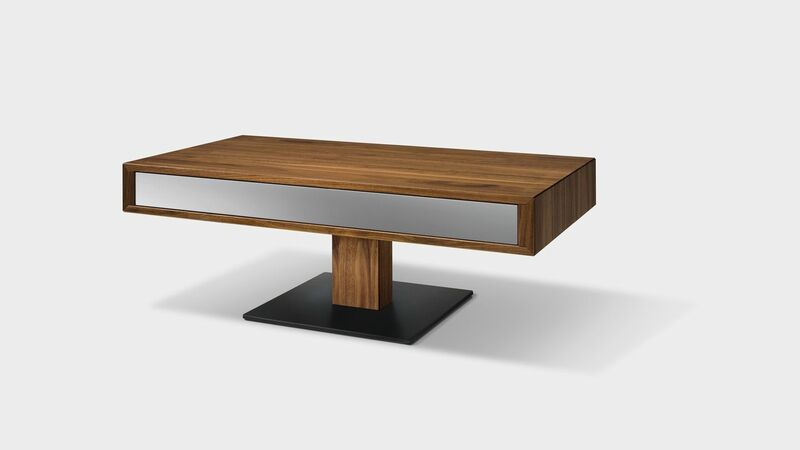 Another trademark element ensures that our coffee table maintains its grip at every height: the sturdy base, which is available in a glossy, stainless steel finish or matt black. If you prefer, you can add colour accents to your living room with a glass plate on top. Always at the height of the time of day. Whether as practical storage, as table for a small lunch or afternoon coffee: the height of the lift coffee table can be smoothly adjusted from 39.5 to 75.5 cm and it adapts flexibly to your needs. The optional electric height adjustment offers maximum handling convenience. It can even allow a height of 79.7 cm. Its simplified operation allows you to make use of larger sizes. Permanent wiring is unnecessary, since a rechargeable battery provides enough power for the lifting technology to be used up to a hundred times to its full height with just one charge. And the charging? There is a perfect time even for this, namely overnight. It requires a high level of precision and skilled craftsmanship to join pieces of different thicknesses. The corner joints of our lift coffee table reflect both these qualities. And because they are so beautiful, we emphasise them even more with a fine shadow line between the table top and side panel.